RTD’s SSD24200HR high speed SSD storage module is based on the M.2 format (formerly called Next Generation Form Factor, or NGFF). Two M.2 Socket 3 interfaces leverage the PCIe/104 Type 2 connector, allowing the inserted devices to utilize a PCIe x4 link or SATA connection for data transfer to and from the host CPU. The Non-Volatile Memory Express protocol (NVMe) enables high speed data transfer from the CPU’s PCIe x4 connection to the SSD device at theoretical transfer rates up to 985 MB/s per lane (PCIe revision 3.0). These low latencies make the SSD24200HR the perfect candidate for edge computing applications. 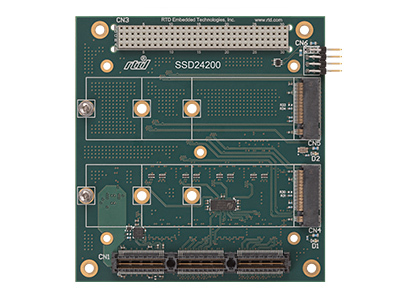 Pair the SSD24200HR with RTD’s 25 MSPS data acquisition module (DM34216HR), and continuous data from four high speed A/Ds can simultaneously be written to SSD via the PCIe x4 connection without losing any data. 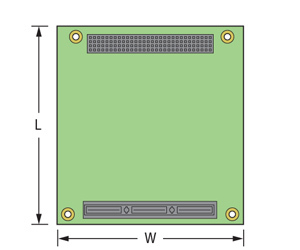 The dual M.2 sockets of the SSD24200HR enable a shorter stack height over traditional PCIe/104 storage technologies, making it particularly attractive to SWaP- sensitive applications which are often limited to one 2.5” SATA drive per board. For applications where only one M.2 socket is required, RTD offers the SSD24100HR single socket ordering option. The options below show specifications for two devices from Apacer. Note that the SSD24x00HR is compatible with M.2 Socket 3 compliant devices from a variety manufacturers. If you are interested in ordering this M.2 carrier with specific devices installed, please contact RTD Sales.